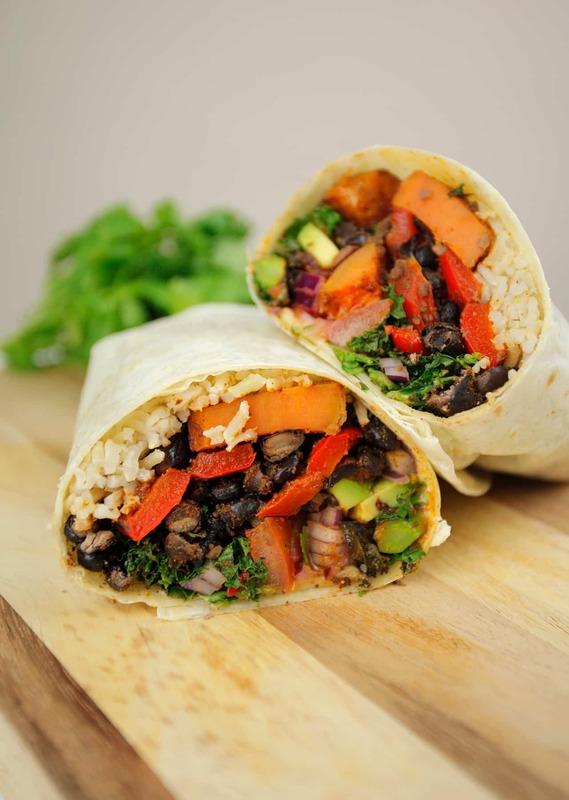 There’s a lot to love about this sweet potato burrito. It’s sweet, spicy and it’ll probably fill you up for the entire day! But the best thing about our recipe is the fact it’s super easy. One of the most frustrating things about making a traditional burrito is you’re left with half a dozen or so pots and pans to clean up! So we decided to come up with our ‘lazy’ version. Most of the ingredients are baked in one tray so it’s no fuss and really easy-to-follow and there’s still tons of flavour packed into the burrito. If you’re looking for a recipe for cashew sour cream, we have you covered over on our famous Taco Ring recipe here. Transfer the sweet potato, peppers and black beans to a large baking tray. Then season with the cumin, paprika, cayenne pepper, salt and drizzle with 2 tbsp of olive oil. Mix together with hands. Bake in the oven for 15 minutes. Remove the tray from the oven and add the kale. Season with a pinch of salt and a tbsp of olive oil, and rub through with your hands. Bake in the oven for a further 5 minutes. Meanwhile, wrap the tortillas in kitchen foil and warm them up in the oven for a few minutes. 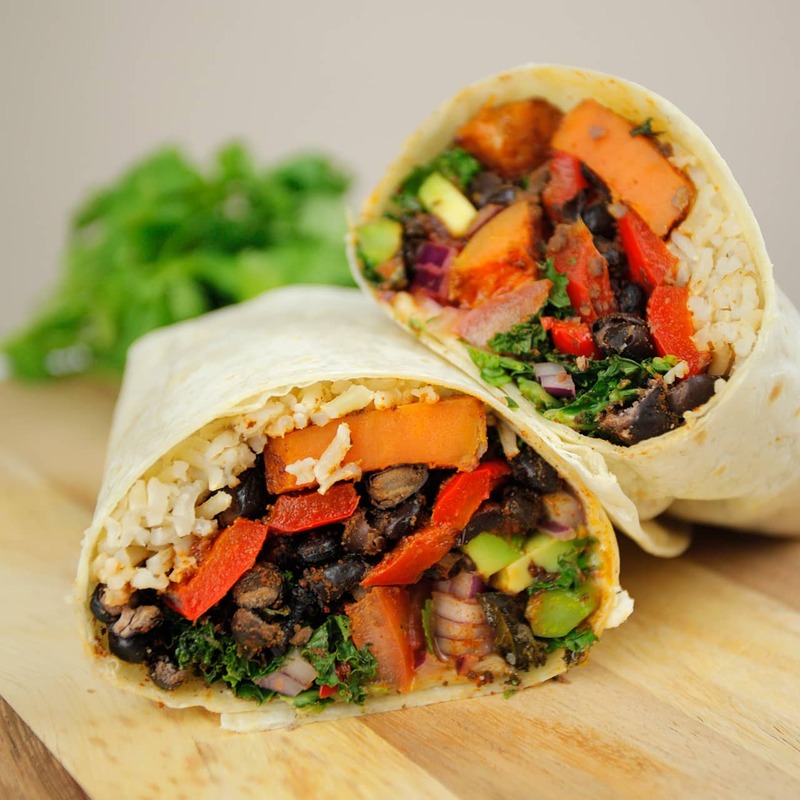 To build the burrito, take one tortilla and add a couple of tablespoons of rice, black beans, sweet potato, red pepper and a handful of kale in the middle. Then top with a sprinkling of tomatoes, red onion, and a few slices of avocado. Finish with a squeeze of lime juice, a sprinkling of coriander leaves and a generous helping of cashew sour cream and hot sauce. Wrap the burrito, then tuck it in. Repeat steps 6 and 7 with the remaining ingredients. Wow. This looks great. Do you deliver? ;). Thank you for sharing your wonderful recipe. The sweet potatoes needed to cook about half an hour longer than the beans and peppers. But, it was delicious! Thanks Crystal! If we cut the sweet potato into small enough chunks then it will take the same amount of time to cook as the other ingredients. Our sweet potato was lovely and soft, hope that helps. do you make the cashew sour cream or can it be purchased? would need recipe please. thank you. I made this today and mimicked the approximate size of the sweet potatoes in the video. They took much longer than 15 minutes to cook, even at 400°F. I ended up having to remove the red peppers and beans to avoid them overcooking. Overall, the flavor was really good and we loved them. We’ll definitely be making them again!